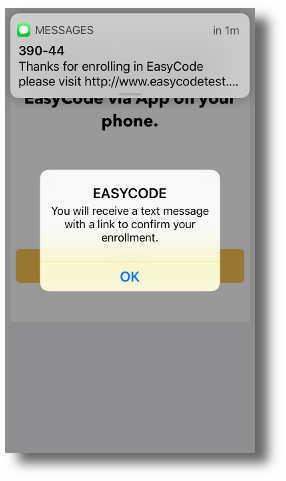 Download the app by searching for or Easycode 2.0 in the Apple store or Google Play. 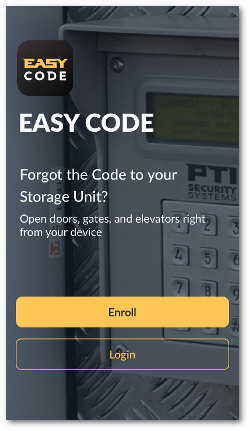 Use it to open facility gate for entry/exit, submit payments, and receive alerts. Designed to give you a seamless experience and no gate card to lose! Once you have received your site key (it will look something like this: Wsc6Y9k) Pay attention to upper and lower case letters. Ignore the field for Authorization Code. Enter the access code you were given at the same time as your site key on the top line. Enter the last name linked to your account. Carefully enter your email address. If you make a mistake on your email address, it is very hard to correct so be sure to double-check it. Enter the phone number of the cell phone you are using. It is important as later in the process, you will be sent a text message confirming your enrolment. Enter password (at least 8 characters). You have to add a symbol such as @,#,$,%,& etc. The app will remember your password, so you only have to enter it once. The second image is what you should see if everything went properly. You will be directed to a link (by text message) to confirm your enrolment.